As we age, one of the most important contributors to our overall health is our diet. We are literally what we eat, and the foods and combinations we choose are totally in our control. 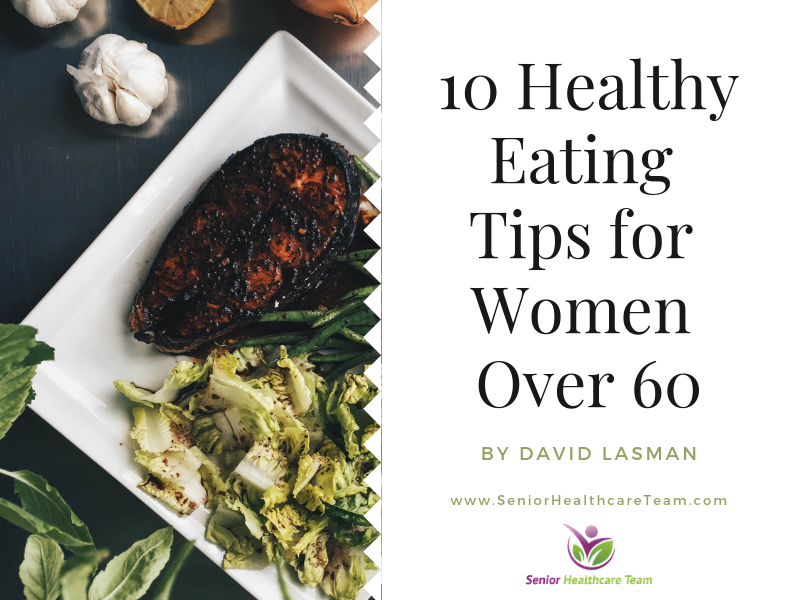 Making simple food choices is especially true for women over 60, who have unique nutritional needs. We need to be sure that we nourish our aging bones, keep our hearts healthy and watch our blood pressure and weight. To help you get started on your healthy eating journey, we have compiled a list of 10 things that you can do to improve your diet. 1. Get Enough Zinc. If you don’t have a problem with dairy products, here’s a tip for strong, healthy nails. Evelyn Tribole, RD, and author of Stealth Health: How to Sneak Nutrition Painlessly Into Your Diet, tells us to add a hard-boiled egg and a glass of milk to your daily diet; the zinc will make an amazing difference in your nails. Tip: If your nails have white spots on them, it’s an indication that you may be low on zinc. 2. Hit the Trail (Mix). Here’s an extra snack idea for women who have a hard time getting enough calories. It not only satisfies your sweet tooth, but also has nutritional value. Make your own cereal trail mix by combining 1 cup of bite-sized whole grain cereal, ¼ cup (57 grams) dried cranberries, and ¼ cup (57 grams) chocolate chips, and 2 tbsp. (30 grams) sunflower seeds. One ½ cup (113 grams) serving is 130 calories, and it’s yummy! 3. Embrace Fish Oil. According to WebMD, Omega 3 fatty acids found in fish are essential to brain development and function, especially as we move through our sixties and beyond. Apparently, these amazing healthy fats may lower the risk of stroke and dementia, slow down mental decline, and enhance memory. What are we waiting for? Fish fry! 4. Go Nuts for Pistachios. Switch out the chips for some unsalted pistachios to potentially raise your HDL (good kind) cholesterol. A study conducted by the Department of Integrated Biosciences at Penn State has shown that eating just 1.5 – 3 ounces (57-85 grams) daily for four weeks can have a positive effect. 5. Go for Organic Ketchup. The cancer-fighting phytochemical, lycopene is the buried treasure in your ketchup. One simple way to make sure you’re getting its greatest possible benefit is to buy organic, the darker in color the better. Organic ketchup has three times the lycopene as any of the commercial brands, says USDA researcher, Betty Ishida, PhD. 6. Go Nuts for Vitamin E. In “Brain Foods That Help You Concentrate,” WebMD, maintains that the Vitamin E antioxidant has been associated with lessening cognitive decline as we age. Eating just an ounce (28 grams) a day of nuts and dark chocolate will give you the vitamin E you need without excess calories you don’t need. 7. Eat Natural Food. Did you know that it’s sometimes better to eat a real cookie than those low-fat or low-calorie snack packs filled with preservatives and artificial flavorings and ingredients? When you say it like that, it just makes sense. Whole food takes your intestines longer to process, so you feel fuller longer. 8. Eat Mindfully. Korean Dahn yoga offers a simple daily diet strategy – “eat real food, not too much, and chew 20 times.” Also, a study in the International Journal of Obesity supports that chewing 20 times helps us eat less, because it stimulates satiety hormones. 9. Keep the Best Parts. Are you throwing away the most nutritious parts of your foods? The greatest portion of nutrients is in the peels of many fruits and vegetables. By peeling that apple or potato before you eat it, you are missing out on the nutrient-richest part of the food. 10. Consider Cinnamon. Sprinkling cinnamon onto your fresh ground coffee before brewing may reduce blood sugar, blood pressure, and even stress. Now that’s hot. Read more about the potential benefits of cinnamon. Healthy living starts of course with the right attitude, and so a healthy, alert brain needs to be nourished as well. Add to that the basic principles of sourcing local and eating fresh, smart and economically, and we will create strong bodies and minds that will allow us to be able to do all the things we have waited all our lives to do.